When, in 1994, I interviewed David Gascoyne over shepherd’s pie in his thirties semi in Oxford Street, Northwood, a somewhat unglamorous corner of the Isle of Wight, he told me of all the Surrealist art he had to sell in order to survive during his fallow period. I should have asked him if he had a copy of his second collection of mainly surrealist poetry, Man’s Life is This Meat to show me, because I knew that it was a legendary rarity and I was unlikely to find a copy outside a copyright library. But I was there principally to discuss Gascoyne’s friendship with Geoffrey Grigson, who first published the best poem in this collection ,‘And the Seventh Dream is the Dream of Isis’ , in an early number of New Verse, when the poet was just 17. It was while at Grigson’s home in Keats Grove, Gascoyne told me, that the bizarre title was chosen. Apparently, the two men were perusing a typographical manual when quite at random they found a phrase 'Man’s Life is…'. They then turned over the next page and found the words 'this meat' at the head of it. It was a truly 'found moment', as Gascoyne admitted. In 1936 Gascoyne at just 20 had already published three books. In 1932, at the age of 16 and while attending Regent Street Polytechnic, he paid for his first collection to be printed. This was the very slim Roman Balcony, which consisted of short poems, each composed of a few images A year later, in 1933,through a family connection with Harold Monro, Cobden Sanderson brought out his brilliant first novel, Opening Day, for which Gascoyne received an advance of £50 which helped finance his first visit to Paris that same year. In 1935 appeared his Short Survey of Surrealism, the product of the meetings he had had with leading surrealists in the French capital . The long poem 'And the Seventh Dream is the Dream of Isis', though published under the strong influence of writers like Eluard and Breton, is nevertheless the work of an extraordinarily precocious imagination . And so it goes on. David Archer, who had already published Dylan Thomas’s 18 Poems in 1934, could hardly ignore this other poetic prodigy, and so Man’s Life Is This Meat appeared in 1936. By this time Gascoyne and Roland Penrose were busily organising the first International Surrealist Exhibition, which duly opened at the New Burlington Galleries, off Piccadilly, on 11 June, 1936. On the opening day, reporters counted among members the smart society people like Lady Wimborne and Lady Juliet Duff, Herbert Read, Osbert Sitwell, Sacha and Mrs Sacha Sitwell, Baroness d’Erlanger and Constant Lambert. Grigson contributed an exhibit and Gascoyne was among those who extricated Salvador Dali from his famous diving suit, which was decorated like a Christmas Tree. Other living exhibits included Sheila Legge, who wore long white satin dress and carried in one hand a model leg ( geddit !) filled with roses, and in the other a raw pork chop (perhaps Lady Gaga was inspired by this get-up). Paul Nash removed a bloater attached to a picture by Miro because of its unpleasant smell. Edward James showed off some of his Afghan hounds. The exhibition, which closed in early July, attracted an amazing 20,000 people. Currently there are only two copies of Man’s Life is This Meat for sale online, both of them interesting association copies. The more expensive of the two contains a fascinating letter from the author and at £450 seems to be one of Gekoski’s uncommon bargains. 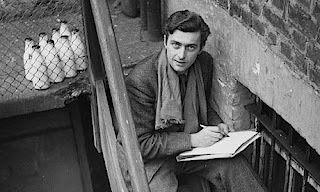 Gascoyne, whose brilliant career was cut short by mental illness, is now regarded as a significant figure in the history of English Surrealism, although one critic observed that he wasn’t an English writer at all, but ‘ a French writer who happened to write in English ‘. Many thanks Robin -- brilliant stuff. 2 sleepers in the poetic realm. In re Dali I heard he was nearly a gonna trapped inside that diving helmet. Good to hear Edward James had a walk on part. Currently I could do with a box full of books by him. Ralph Chubb, The Golden City.